Medium-Term Strategy 2020 "Declaration beyond"
NTT DOCOMO announced Medium-Term Strategy 2020 "Declaration beyond" on April 27, 2017. Looking ahead to the year 2020 and beyond, we will aim to amaze and inspire beyond expectations for our customers and create new values hand-in-hand with our partners by exceeding customers' expectations. 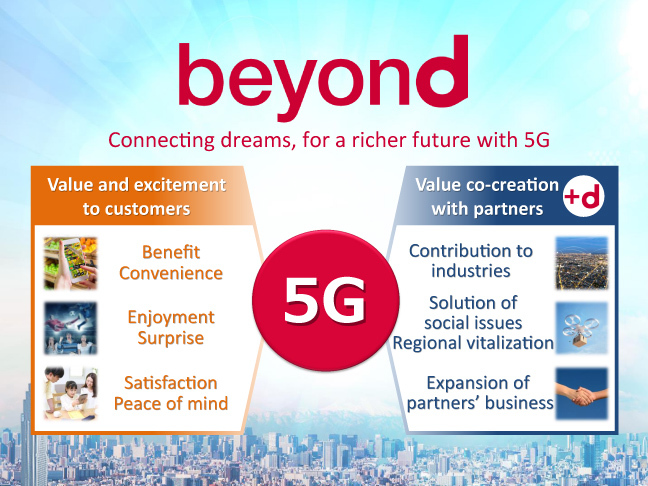 The word "beyond" reflects our will to transform ourselves to realize a richer future with 5G. For our customers, we will offer enhanced benefits and convenience as well as value and inspiration, such as enjoyment, surprise, satisfaction and peace of mind, and realize the co-creation of new values through "+d" initiatives such as making contributions to industries, solving social issues and expanding our partners' businesses. NTT DOCOMO's corporate philosophy towards the creation of a new world of communications culture. Expressing our strong commitment to leverage innovation in revolutionary ways that will enable all customers to realize more convenient and enjoyable lives. NTT DOCOMO's corporate vision for 2020, "HEART: Pursuing Smart Innovation." Please read through DOCOMO' s new initiatives for medium-term targets. In addition, we will allocate internal reserves to research and development efforts, capital expenditures, strategic investments and others for the purpose of generating innovative technologies, offering attractive services and expanding our business domains. Our corporate group aims to contribute to society by carrying out our business with integrity and living in harmony with society. Based on the philosophy described in our CSR Message, we will work to create abundance and convenience in life and culture, address issues of the global environment and tackle social concerns, so that we can contribute to sustainable development of the society.